The MLA-1 overcomes the inherent 20m restriction in MIDI cable runs, converting MIDI signals to a highly robust balanced signal that can be transmitted over 300m of CAT 5/6 twisted pair or conventional balanced audio cable. 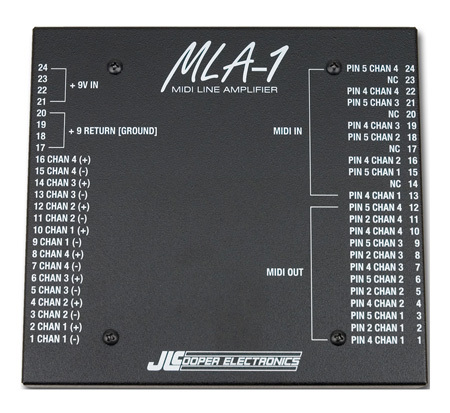 The MLA-1 is equipped with four pairs of MIDI In/Out connections and a 24-pin terminal strip for connection to the long-distance cable runs. An MLA-10 or MLA-1 at the destination provides the matching four channels of bi-directional conversion returning the data to normal MIDI signals. An alternative configuration is to send each send/receive data pair to a different destination, where the conversion to a single MIDI connection is made by an MLA-XLR. The MLA-1 can be powered by a local power supply module or from an MLA-10 via the multi-core cable connection allowing it to be conveniently located away from any mains power outlets in wallboxes or roof spaces.